Today I thought I would put up a post about putting together a cheese platter…because…they are just the best right? How good is it when you go to a dinner party or a restaurant and you get to indulge in a cheese platter? They look fantastic and taste incredible! These are just a few key tips that are great to think about when you are creating a cheese platter. We eat with our eyes first! I think the main reason why people get excited by seeing a beautiful cheese platter is the abundance and variety of shapes, colours and textures of the cheese and complimenting ingredients. Think of what different produce you can add that will compliment the platter visually – for example, how beautiful are simple cherries? or a dark golden syrupy honey? The presentation of the cheese platter is all part of the fun! Try think of ways in which you can make it look bountiful. When planning your cheese platter, try selecting at least 3 or 4 different cheeses! This way you balance out the cheese flavours and also this provides variety for you and your guests, as you know we all have our favourites! 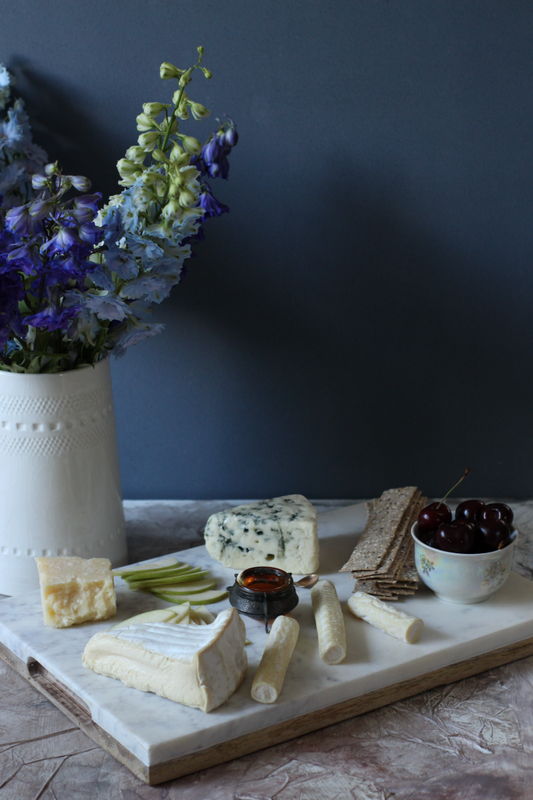 Stick with the basics like a soft cows cheese, a strong blue cheese, a sharp aged cheese and a smooth goats cheese. Once you have those cheese types, perhaps think about adding a smoked cheddar cheese, or go for something a little different at your local cheese deli. Add one or two fresh items. Since cheese can be quite heavy, it is lovely to balance it out with something light and fresh. Think crispy thin green apples, or juicy cherries. Pears, grapes, blackberries and apricots also go really well with cheese. Include something sweet such as a citrus marmalade or pure honey. I am in love with the combination of parmesan and honey! Add some crunch. This can be crackers, toasted bread and all types of nuts – in particular walnuts and almonds! I would love to try some roasted chestnuts on a cheese platter.